This van caught my attention and inspired me to share some observations. 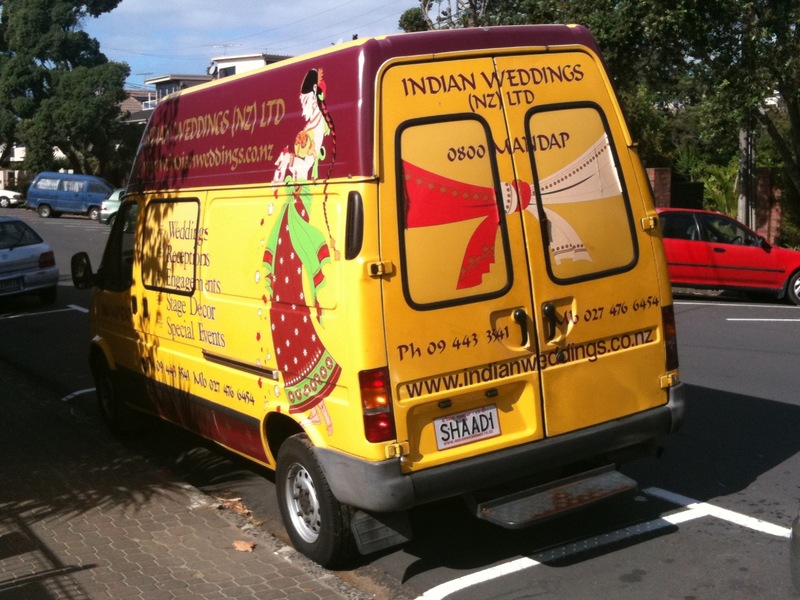 A catchy headline that clearly conveys the main business offering: Indian Weddings. An eye catching design that is consistent with the Indian theme. Easy to read information about other services. A website address that you do not need to write down. Do you have a clearly defined offering of your products and services? How well have you defined your target market? Are you clear about your point of differentiation? If you cannot answer these questions, how on earth do you expect to attract the attention of prospective customers? Once you have answered these questions, check that your answers make sense to others. Include “friends, families and fools” as well as some of your customers. You then need to decide how best to communicate your offering and how to reach your target market. It might also be a good idea to test how well your messages are being understood. If you are really keen, you might even want to measure the results! Tip: keep your eyes, ears and mind open when you are going for a walk! You can learn from others without taking anything from them. Disclosure of Interest: none. I was walking past the van and decided to take a photo. I have not had any contact with the company. I like the number plate! Shady business? A little offputting for potential clients… or just another eye-catcher? Shaadi is an Indian name and has nothing to do with the English word “shady”. I quite understand your reaction. “Shaadi” might be off putting for those who do not have Indian heritage, but they are unlikely to be potential clients. Your comment does raise the important consideration of “how will this name work in other languages?”. A well quoted example is that of the Chevrolet Nova, which sounds like a nice name in English, new and perhaps a bit exotic. This does not work so well in a Spanish speaking country such as Mexico. “Nova” would sound like “no va” (does not go) and not have the connotation of “nueva” (new).